【Multi-function】: Blue LED Only, this is NOT colour changing. 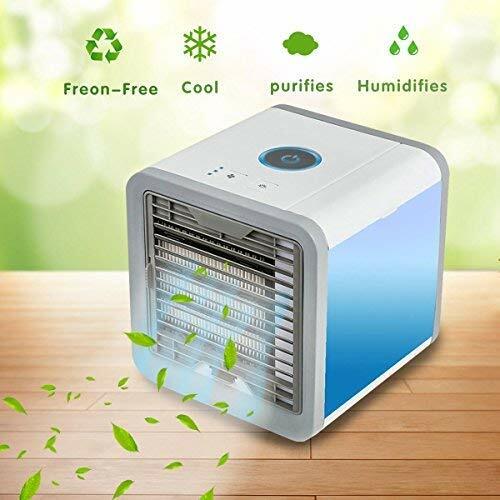 Mini evaporative air cooler, refrigeration, humidification and air purification all in One, keep away from dry air and reduce allergens, dust and smoke, which ensure you will enjoy the right amount of chilled air as you desire. 【Adjustable】: Three wind speeds (high, medium, low) can be adjusted and enable to get to 5-8 degree ,you can choose the most suitable one to enjoy your leisure time, sleeping or working time. 【Portable Design】：Only 10.3-inch, 2.9lb, very easy to carry & move, simply fill with water, plug it into USB port or power bank and the three-speed fan will start blowing. Built-in water tank lasts up to 8 hours. This desktop cooler can be used as a soothing night light, sleek compact design fits nicely on your desk, bedroom. The built-in LED mood light can be set to any of its 7 color option, or set to color-cycle mode or turned off with the touch of a button. guides the air flow through the proprietary cooling filter to boost its purification while reducing its temperature and then delivers refreshingly cold air!